Posted in Pasta, Salads, on September 4th, 2008. Now don’t get all squirrely on me – some of you may read that title and think – oh no – that sounds awful! Not so. This is actually a cold side dish with an Asian influence. It’s healthy (lots of spinach) and can stand in as a pasta or a salad. So, don’t just delete this and move on. Read through and at least see what’s in this! It had been some years since I’d made this salad. Well, actually, the dish is supposed to be a hot side, but with ribs and a green salad on a warm summer evening, I wanted a cold salad. So I took a recipe I’ve made before, adapted it a bit and made it a cold dish. Hugh Carpenter is a master of combining Asian condiments and making them into deliciousness for salads or side dishes. I perused my pantry to make sure I had the necessities (spaghetti, pine nuts, garlic, basil, cream and hot chili sauce). Onto my grocery list went the rest: fresh spinach, chives, and cilantro. My daughter, Dana, made this for me, for a family dinner the other night. This recipe comes from Hugh Carpenter’s book Pacific Flavors, his first cookbook. He was on the cooking school circuit, as I recall, and I bought the book at one class he taught in Pasadena in 1988. Everything he prepared in the cooking class was outstanding. I’ve mentioned him before in some of my recipes – particularly the New Wave Garlic Bread (relatively traditional garlic bread but with an Asian twist), the fabulous Baby Back Ribs with Peanut Butter Slather (I mean, that explains it all, doesn’t it? ), another great side dish of his called Tex-Mex Jicama Salad. And then, my all-time favorite Carpenter dish, the Grilled Ribeyes with Amazing Glaze. And I just blogged about the other pork ribs, the All-Star Asian Ribs. So, I suppose you could say I’m a fan of Hugh Carpenter’s cooking style. I own three of his cookbooks – the one mentioned here, also Hot Barbecue (a more recent one) and Chopstix (his take on “quick” Asian food). All of his dishes, though, are untraditional Asian. They’re Pan-Asian, or Pan-Californian, or Fusion. Whatever you want to call it. He uses all the different condiments and spices from multiple Asian cuisines and combines them into fresh foods with a California kind of flair. So, this dish . . . it’s nothing but cold noodles tossed with a garlicky spinach sauce. 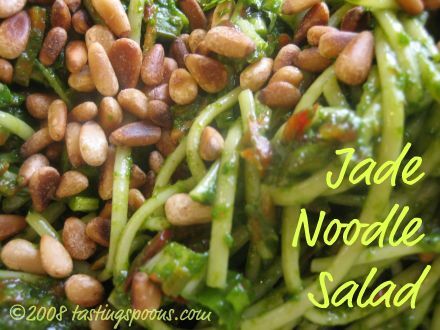 The spinach is whirred (liquified) in the food processor along with a few other ingredients and poured over the noodles before serving with a generous amount of toasted pine nuts on top. That’s it. All of it can be done ahead except combining the noodles and the sauce. If you like a hint of Asia and want something a tad different, this is your ticket. Serving Ideas: This can also be made as a hot side dish if you prefer. Just heat the sauce and noodles together until heated through, then garnish with the nuts and cilantro. 1. Bring at least 4 quarts of water to a boil and add the noodles. Cook until they are al dente – still a little bit of firmness – about 5 minutes. Drain and rinse, then set aside. Add the bell pepper and carrots to the noodles and refrigerate until ready to serve. 2. In the food processor drop the garlic cloves and salt down the feed tube and allow this mixture to sit for a few minutes while you gather the other ingredients. 3. Add the spinach, chives, cilantro and basil and puree until smooth. Then add the chicken stock, cream, salt, sesame oil and chili sauce. Puree again. 4. When ready to serve pour the sauce over the noodles. Add more salt and pepper if needed, then garnish with pine nuts and additional sprigs of cilantro. Per Serving: 299 Calories; 18g Fat (51.3% calories from fat); 9g Protein; 29g Carbohydrate; 4g Dietary Fiber; 27mg Cholesterol; 688mg Sodium. sounds delicious – love the name you gave it! This is absolutely my kind of dish. I adore noodles and spinach. Thank you for posting it.